Objective: Students will produce their own personal brand of cereal, analyze the nutritional content, and apply FDA standards to their marketing claims and creation of food labels. Have boxes of store bought cereal for students to look at and compare. Have them read the food labels and see how many items they can identify in the ingredient list, etc. Explain the importance of folic acid for women who are or might become pregnant. Discuss the amount of sugar in common kid’s cereals. Have students weigh out the grams of sugar per one serving of cereal and do a comparison between cereals. 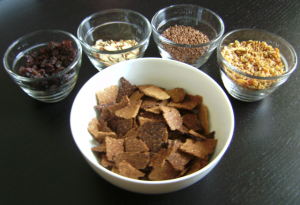 Have students follow the bran flake recipe to make bran flakes. Once their bran flakes are made, instruct them to weigh the total amount produced (discarding any burnt pieces). The first step is to have the students create their own food label. According to the US standards of food label guidelines, foods must have a nutrition label. Students should determine a serving size and then figure out the total amount of calories in their cereal. There are two ways to go about figuring out how many calories are in an item. The first way is to use a calorimeter and burn the food to calculate the amount of joules of heat it gives off. If you want to have your students use this method you can create your own calorimeter or borrow some supplies from your science department. Typically a science class calorimeter is made with a stand that holds a test tube of water with a thermometer in it and a piece of food secured to a cork by a paper clip and sits on the table beneath the tube of water. The food item is then set on fire. A calorie is measured by the amount of energy it takes to raise 1 gram of water 1.8 degrees Fahrenheit (1 degree Celsius). The second way to calculate calories is to use a database of pre-calculated foods. 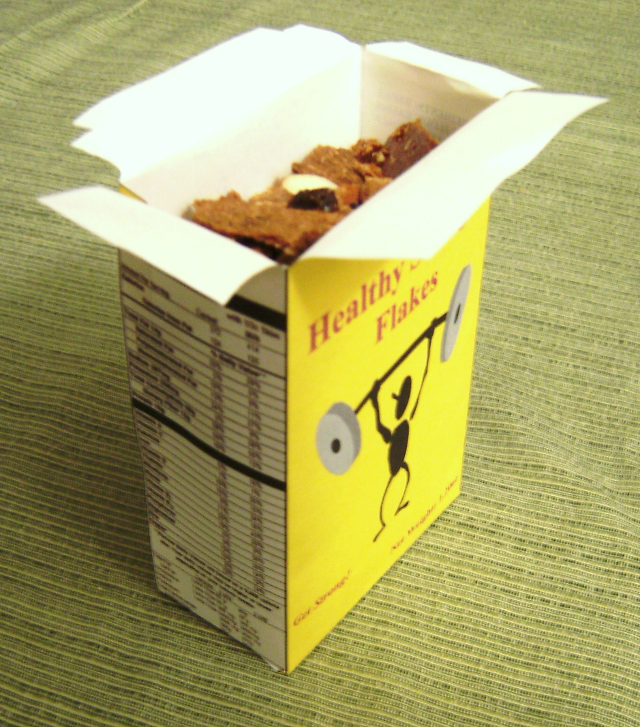 One free site that I suggest is www.fitday.com It has lots of foods on the site but it also has a place where you can create your own food item. This means you can have your students input the nutritional label off the bag of Whole Wheat flour they used. This is obviously more accurate. Fit Day will do the analysis for you as far as how many calories, vitamins, minerals, etc. The only down side is that it requires users to create a login and password. Next students should create their own box for their cereal. They should include a creative name, graphics, their food label, price, any nutritional claims, and manufacturer’s address. Or you can use Mr. Breakfast to create and print your box! *Note this site does not allow for the nutrition label or much creativity. Check it out to see what I mean. Cost Analysis: have students figure out how much it costs to make the cereal and then mark it up for profit. When everyone is finished have the class look at all the cereal boxes and decide which one is the most eye appealing, best deal, has the least/most calories, has the most/least sugar, has the best taste, has the best nutritional claims, etc.